Pro-Ject MaiA review | What Hi-Fi? 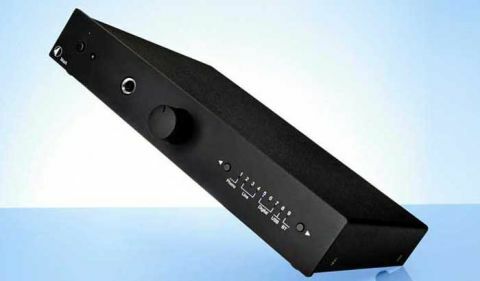 As a small, integrated stereo amplifier that’s chock full of connections, the £400 Pro-Ject MaiA is a tempting piece of kit at first. But the MaiA (a stylised abbreviation that stands for “My Audiophile Integrated Amplifier”, which we can all agree is a bit of a mouthful) isn’t quite the small wonder we hoped for. This amp has a built-in hi-res DAC and Bluetooth streaming (among others), but it can’t quite compete with its rivals in this class when it comes to performance. The MaiA’s tiny, compact dimensions are a welcome sight to anyone who doesn’t want to clutter their house with large, black boxes of hi-fi. Slim as it is, the MaiA still packs some weight. It stands just 4cm tall, but it weighs 2kg. We like a sturdy bit of kit, and the MaiA’s aluminium chassis exudes a sense of quality. The fascia is fairly neat and classy, too. Two small buttons let you scroll through the nine (yes, nine) inputs and a tiny blue LED indicates which input is selected, while the weighted volume dial takes centre stage (the MaiA is available in black or silver finishes). One tiny niggle: the speaker terminals aren’t labelled as to whether they’re left or right, which will confuse users. A slim, credit card-style remote is included, and while we wish it was a bit more substantial, it does its job with speed and no fuss. Unusually for an amp of its kind, the MaiA has a phono input. Ever since small integrated amplifiers such as the NAD D 3020 and Monitor Audio Airstream A100 were introduced, the phono input has taken a back seat in favour of Bluetooth streaming and hi-res connections. But with Pro-Ject’s rich heritage and expertise with turntables, it makes perfect sense that the company has included a moving magnet phono stage (that’s been based on Pro-Ject’s Phono Box design). It’s a good thing, too, as the phono input sounds the best out of all its inputs – but we’ll come to that later. If you don’t own a turntable, you can connect your CD player, streamer or laptop to any of the two line level, two optical, coaxial or type B USB inputs. The built-in DAC is capable of playing 24-bit/192kHz hi-res files through the coaxial and asynchronous USB inputs; it’s restricted to 24-bit/96kHz over optical. There are also 3.5mm audio input and output jacks, and a 6.3mm headphone socket. aptX Bluetooth is also on the MaiA’s features list, but you’ll need to screw in the supplied Bluetooth antenna before streaming songs from your smart device. The connection is stable, but the pairing procedure has a little quirk: you have to press the power button once the appointed LED starts blinking, otherwise the handshake won’t happen. It’s impressive how much Pro-Ject has managed to fit inside such a small chassis. It’s just a shame it doesn’t sound nearly as impressive. For while it sounds solid, weighty and has a good deal of detail definition, there’s a lack of enthusiasm. The MaiA’s rhythm trudges along, sounding laboured and weary – bringing down the mood. We want a livelier, more upbeat rhythm. The bassline in Prince’s Let’s Work (24-bit/192kHz) sounds loose and lumpy where it should be taut, punchy and agile. It’s a funky beat, yet the MaiA can’t quite convey the tight rhythms. The stop and start of notes aren’t precisely etched out, either, so the sharp, staccato beats don’t have their snappy impact. Dynamically, it sounds a little squashed, so there’s no breathing space for the songs to soar and flow. It’s part of why the amp sounds so restrained. Nick Cave’s We No Who U R (via CD) is admittedly gloomy and moody, but talented amplifiers like the NAD D 3020 are able to pick up the steady rhythm and inject a sense of purpose to the tone. Through the MaiA, it sounds flat. While the top end could have more sparkle, it’s open and doesn’t have any hard or coarse edges. Voices are pleasingly warm and expressive, such as in Fleetwood Mac’s Gold Dust Woman (24-bit/96kHz). It could dig deeper to fully reveal subtleties and nuances in vocals, but we appreciate that there’s no thinness at hand. As we mentioned earlier, it’s with the phono input that the MaiA sounds its best. Plug in a budget turntable such as the Award-winning Pro-Ject Essential II (£200) or the Debut Carbon (£325, also five stars), and the MaiA has a bit more freedom to stretch its sonic wings. There’s a hint of grit and spark to Cave’s voice, where before (when using the USB or coaxial inputs) he sounded weary. It’s still not as exciting as we’d like, though. We wish we could say that the Pro-Ject MaiA is the ideal stepping-stone for someone with a record collection who now wants to experiment with smartphone streaming. If only it had a touch more punch and liveliness to its delivery, we’d be giving it a hearty four-star recommendation. The smart build and features notwithstanding, there are similarly priced rival amplifiers who get the job done with more enthusiasm and skill. A decent effort, but not quite an engaging performance in the end.